How it's Made: Your kombucha tea is fermented by a bacteria culture (The "Mother" or "Scoby" for Symbiotic Culture of Bacteria and Yeast.) All you'll need is sugar, your scoby, and black tea to make your fizzy health drink. Most sources recommend black tea but I've made it successfully with rooibos, hibiscus and even ginger tea. Why It's Healthy: Modern North American society is obnoxiously germ-phobic. Everything on store shelves is heated to the point of killing beneficial bacterias and many vitamins, minerals, and enzymes. The healthy bacteria (probiotics) in fermented food like sauerkraut, pickles, kombucha and raw vinegar alkalize your body and speed-up/aid in digestion. With less energy spent on digestion, you should feel light and more energized. Your cells can then dedicate more time to repairing and improving, too. They should be a go-to to prevent and/or solve any digestive issue, especially constipation. It can be used externally as a hair and skin softener, too! It's a tonic that improves all areas of health, since good health starts with robust nutrition and digestion. Store Bought vs. The Home Made: Home made kombucha is not only monumentally cheaper than the stuff you'll buy for $3.75+ a bottle, it's also healthier. The FDA forces companies to pasteurize their kombucha. Probiotics are then added back to the bottles. They're still beneficial and delicious, I may buy a bottle on-the-go, but they're as healthful as the kombucha you'll make at home. Taste: Making your own kombucha means you can play with the flavoring. You can fermented it longer for a more sour taste or ferment it less for a sweeter taste. You can play with different flavored teas. All kombuchas are delightfully fizzy and a touch vinegary. I enjoy the hell out of the taste, it may be an acquired taste to others. Step 1: Steep your tea in 4 cups of water for 5-10 minutes, add and dissolve your sugar. Step 2: Fill vessel 3/4 full with cold water. Wait until the tea is room temperature to proceed. You can blend your kombucha with other beverages to yield tasty results, experiment! I've had ginger, grape, green-drink, chai, green tea, pear...lots of varieties! It's not hard to blend away any trace of it's natural acidic flavor. Tip: Clean EVERYTHING that will touch your SCOBY with apple cider vinegar before you get started. Spray your hands with it and swipe the jar with a cloth soaked in it. When you run out, use the same SCOBY and start over! You'll notice your SCOBY will readily grow and reproduce like crazy. You can "separate" it (you can "peel" the layers) or cut your SCOBY into pieces and have them in several jars so you have lots of kombucha brewing at once, sell them, give them way, dehydrate them into pet treats (VERY healthful for your pets, especially sick ones), eat them yourself, or even use it as a super rich plant fertilizer. I'll follow-up with more things you can do with/more benefits of kombucha. It's an incredibly health-boosting beverage and damn tasty, too! Let me know if you have any questions now or along the way in the comments or via e-mail. 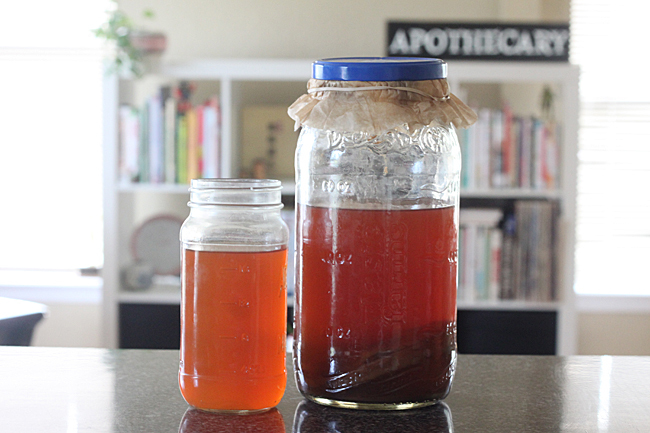 It's scary at first, but once you get the groove, it's too easy to make your own kombucha health elixers. I bet it is! It's expensive here too, up to over $4.00 a container. Better to buy it once and brew your own at home. I'll follow-up with more info on why the stuff's so amazingly healthy for you :) I hope you do start brewing it at home. Never heard of this before! I love it when things are both healthy and tasty :-) And I love drinks and food with ginger! It's perfect as a sub for beer or soda because it's naturally carbonated. I'm not always that healthy, I need to start as I near 40 but I do like kombucha. This is a great idea. I'm excited to check out some of her films. Kombucha is an amazing all-around health tonic to incorporate, give it a try, even if you just buy it from the store, it's amazing for digestion which in turn makes it good for your whole body.